2. 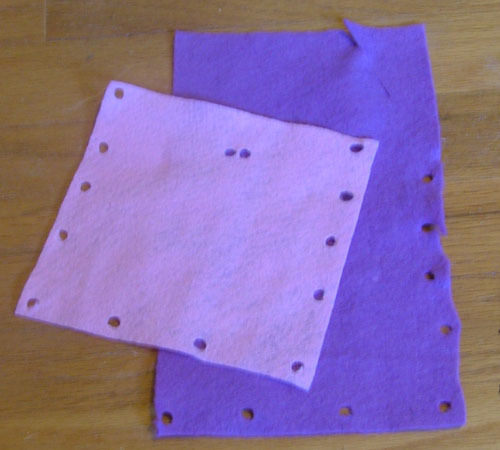 Line up pieces of felt and evenly punch five holes in the side and two on the bottom of both pieces. 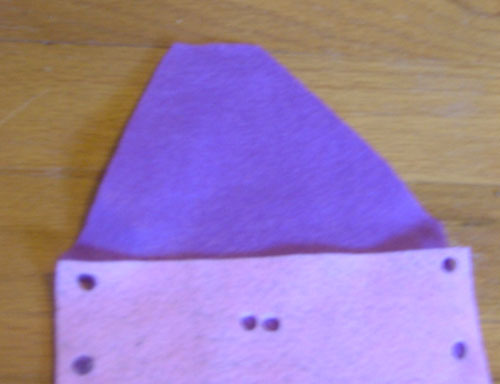 Then punch two more holes at top center of the shorter piece for your button. 3. 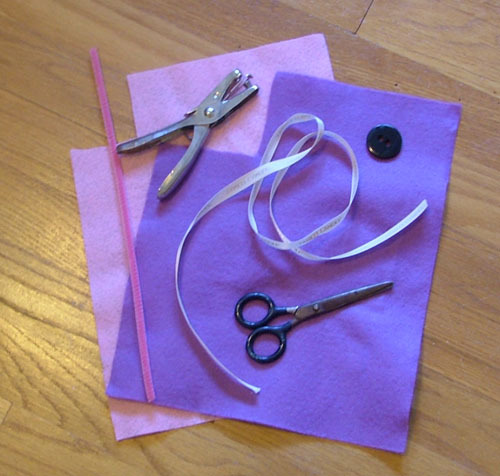 Cut the top of the longer piece into a flap for your purse. 4. 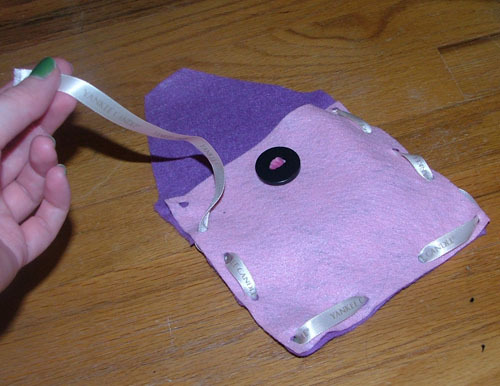 Thread your button with a 3″ piece of pipe cleaner, twist to secure. 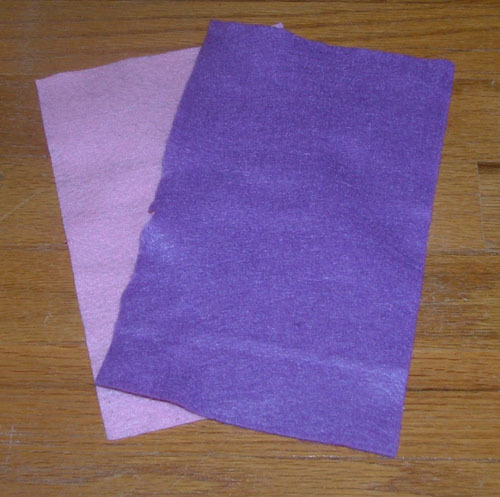 Thread it through the holes you punched in the middle of the top of the shorter piece of felt, twist to secure, and cut off excess. 5. 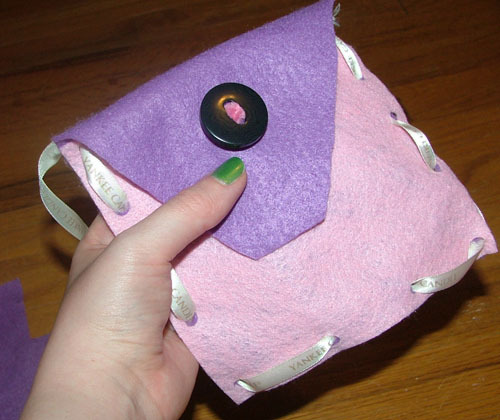 Thread ribbon through holes in purse as you would if you were sewing. 6. cut a slit into your flap for the button hole and voila! Would like to have new ideas. This is a neat i plan on trying this with my daughter tommorrow!!! it is very nice and a wenderfull ideas. 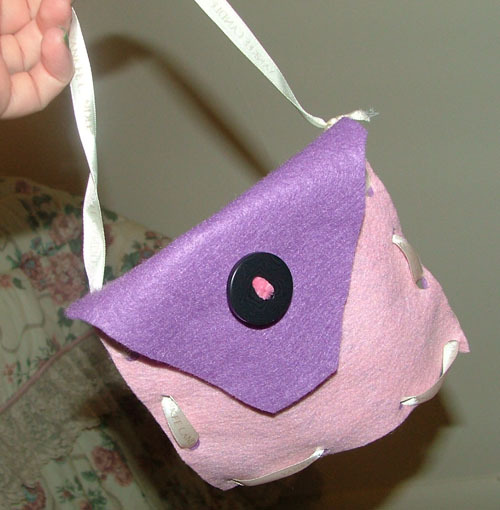 A cute eco-friendly hand bag for kids……….Excellent. wow this is amazing! i wonder how many more things that i can learn? sooooo cool i want to do it so made but i dont have the right stuff to do it! ! ! ! ! ! ! ! ! ! ! ! ! ! ! ! ! ! ! nice idea, but kinda looks thrown together. I would make the ribbon smaller stitches along the bag, so that it holds together better. maybe double the layer of felt too. little girls always want their own purse, to be just like their mommy. nothing wrong with that. 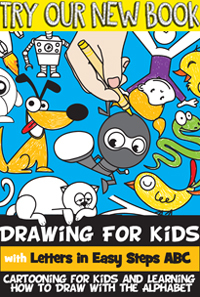 doesn’t mean they’re being ‘too grown up’ making this craft! all in all, a nice easy craft idea. great to do on a rainy day with a little girl. thanks for the share. wow i like this art.